In 1851 James Jarrett a Professor of music occupied this property. He was still there in 1857 but by 1869 J.H. 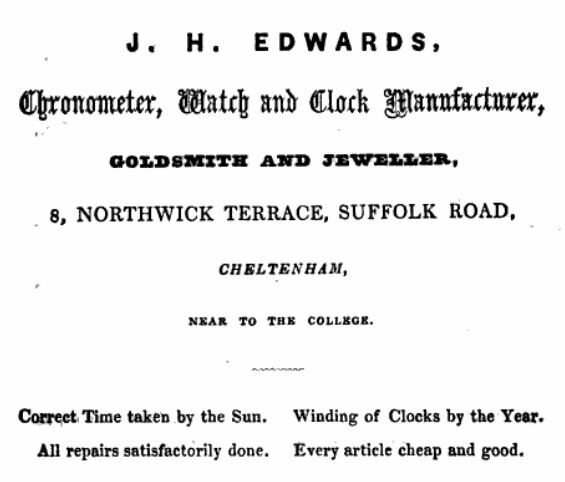 Edwards, Watch and Clock manufacturer was here. They advertised that they took the correct time "by the sun". This was after standard time began to be used in Britain, by the railways, in 1847, so they must have made an adjustment for longitude. It is unlikely that any jeweller in Cheltenham could do this today! Edwards was still here in the 1881 census. By 1891 the trade had changed again to George Jones, Boot & Shoe maker, and we know he was still here in 1917. Later, in 1934, a Mrs B Avery is listed here as a Wardrobe Dealer. However in 1938 a Mrs B Dodwell is also listed as a Wardrobe Dealer and perhaps she had remarried? Then by 1950 another Watch and Clock repairer was here, when the property was The College Clock Shop, advertising pre-war standards of service and workmanship. It is interesting to reflect that the economic impact of the Second World War lasted well into the 1950s. In 1961 the trade had changed again to Playfair, Fancy Goods but by 1969 a P. Welch had taken occupation as a Secondhand Goods Dealer, which by 1975 had changed to Janet Antiques.